While calls are still being made for investigations into what went wrong with Racing Club Warwick and the district council, a new dilemma has arisen in the town. Back in July last year all seemed well as the football club was finally issued with a new lease and the Ministry of Defence - which had already quit a drill hall for air cadets built on part of the club’s site - was offered up to £500,000 compensation. The hope was that Racing Club could make use of the redundant drill hall, for which they had been paying rent - although they have still not be given keys to the building. 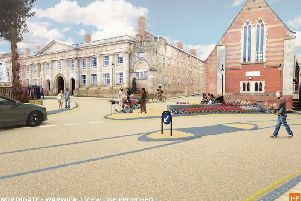 Meanwhile the MoD could build a completely new headquarters for its air cadets in another part of Hampton Road, sharing the site of the Warwick Marching Band. But now the Courier understands the MoD may not, after all, settle for sharing the band’s site. On Wednesday nobody from the MoD was willing to comment but it seems the distance from the road to any new HQ would involve an additional £50,000 to install basic services like gas, water and electricity. Meanwhile at an overview and scrutiny committee meeting on Tuesday night Warwick councillors Linda Bromley (Ind) and Michael Kinson (Con) revived their “scoping document” to initiate an enquiry into the issues surrounding Racing Club to attempt to understand what led to the costly disputes - as a learning curve. The issue was discussed in private. A spokeswoman for the Overview and Scrutiny committee confirmed: “A scoping document for a potential task and finish group was considered by the committee on Tuesday.